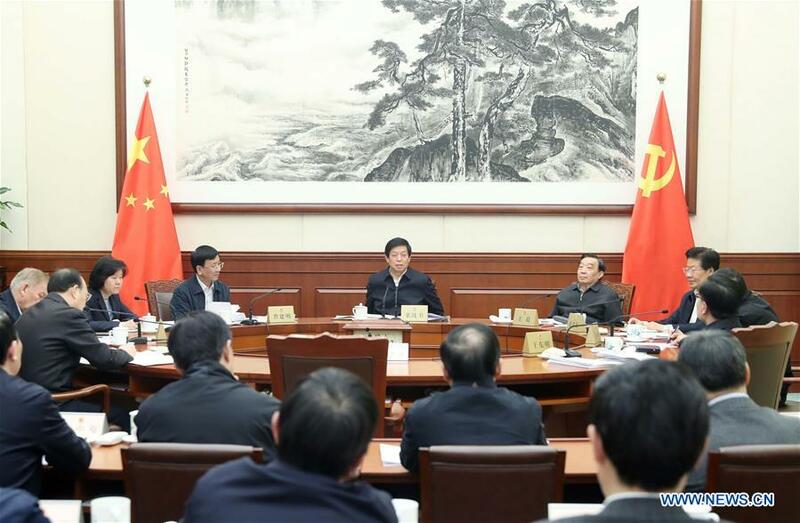 The leading Party members' group of the Standing Committee of the National People's Congress (NPC) met Monday to study a recent speech made by Xi Jinping, general secretary of the Communist Party of China (CPC) Central Committee, on Party governance. Li Zhanshu, a member of the Standing Committee of the Political Bureau of the CPC Central Committee, chairman of the NPC Standing Committee and secretary of its leading Party members' group, presided over the meeting and delivered a speech, said a statement issued after the meeting. Xi's speech at the third plenary session of the 19th Central Commission for Discipline Inspection (CCDI) of CPC pointed out the direction and set the agenda for the campaign to comprehensively and strictly govern the Party and fight corruption, the statement said. Senior legislators agreed that lawmakers should follow Xi's speech and the spirit of the CCDI session in terms of their thinking and actions, the statement said. The leading Party members' group and Party committees of NPC at all levels should continue to uphold the Party's overall leadership, thoroughly implement Xi's instructions and decisions made by the CPC Central Committee, and improve the management of Party organizations within the NPC, it said, adding that senior officials should set the example in this regard.